Lots of visitors stopped by the blog today. I looked into it, and it turns out if you do a Google search for ‘depressing Blue Monday,’ this blog is second on the list. I’m happy to have this distinction, because otherwise I would have forgotten that today was, in fact, “Blue Monday,” officially the most depressing day of the year. It’s the day when miserable weather, mounting debt, loss of the holidays, lack of motivation and stunted New Year’s resolutions finally catch up to people. So a British psychologist took all of these factors and actually created a mathematical formula to determine that yes, the third Monday in January is in fact as bad as it gets. I like to mark Blue Monday because, regardless of what you think about randomly-well-publicized-but-otherwise-arbitrary scientific studies, it doesn’t hurt to believe that the year’s only going to look up from here. And what better way to celebrate a sad winter day than to go out for a bike ride? I actually convinced Geoff to ride with me this morning. We stepped outside into weather that was completely unbelievable. You’d really have to live where I live to find it unbelievable. The temperature was perfect - 29 degrees - warm enough to shed a layer but not so warm it makes everything melty and sloppy. The sky was mostly cloudy, which in Juneau means “almost sunny.” And, most astonishingly, there was no wind. No wind at all. Geoff and I both agree that this was the first day since October free of all the typical factors, of which we nearly always have at least two: precipitation, wind and cold. We set out south along a corridor lined with fresh snow piles that tumbled down the other day when the city set off a series of avalanche-control rockets. The road was so dry that we could hear our studded tires crackling on the pavement. Subdued sunlight sparkled on the water, so smooth I could see reflections of blue-hued clouds as they shifted across the sky. 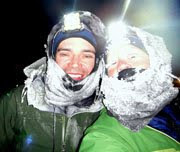 Geoff and I talked for a while about what the Sustina 100 will be like - the crushing pain, the endless night-lapsed day. Nothing could be further from reality on Blue Monday, when legs spin so easy its almost as if our wheels are alive. Some cyclists call these “no chain” days - days so fast and effortless that pedaling is like spinning a crank cut loose of all resistance. I decided to head north after Geoff turned homeward. I ended up riding almost 20 more miles, despite intending to only put in a 15-mile day. Sugar coasted over the dry ice and crackling snow. It’s been a while since my mountain bike and I spent a morning together, and it seemed a good day to let him fly. I turned around when my watch told me I had to, looking back wistfully as the smokey reflection of the sun rolled lazily to the southwest. It’s days like Blue Monday that I could ride forever, and would if given the chance. I haven't had a ride like that since my second cross race of the season. Come to think of it, that was the last day I rode. But you're right, days like that are meant to be cherished, and you do feel like you could ride forever. It's when I finally get a day like that after the winter layoff that I begin planning big training rides and races. I'm jealous (again); I've not been out on my bike since the 11th and it looks like it will be another few days -- if not some time next week before our streets are cleared of the snow and ice. I'd be willing to try it myself, but I don't trust my two youngest being out on the streets right now so I'm having to drive them two and from school, etc. Man, we are stir crazy and the Blue Monday thing seems about right to me. Jill, beautiful pictures, as always. we had a similiar monday down here in california. actually, it was a lot warmer - in the 60's. but with clear skies and no wind. perfect cycling weather. your pictures are always so amazing. I love your blog. I know nothing about biking and my blog is just nonsense, but I've bookmarked yours! I'm traveling to Alaska on a cruise this summer, and your blog makes me so excited for that! I feel like a wimp cuz it has dropped into the single digits here in Reno Neevada and I have put my bike into the rack until the bubbles from my nostrils stop crystalizing. 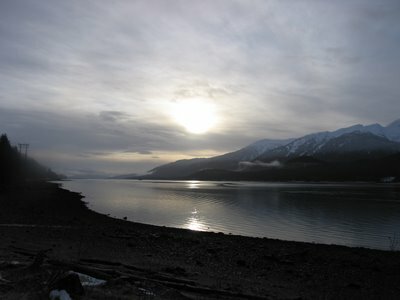 Love the blog, love the pics, glad I live in a post-glacier climate. Ride safe. Have you ever considered writing a book (or multiple books)? Your descriptions are so enthralling, your adventurous spirit is infectious, and I'm sure that from the number of folks who love to read your blog that there is definitely a lot of interest out there. There really aren't that many folks out there who can communicate compellingly about interesting subjects. Then you could use the money to finance more biking!